There are certain images that just spark something in me… and today, it was one that Beca posted on Facebook. I know that some people may say, “A car can fit four or five people, that’s an exaggeration.” However! 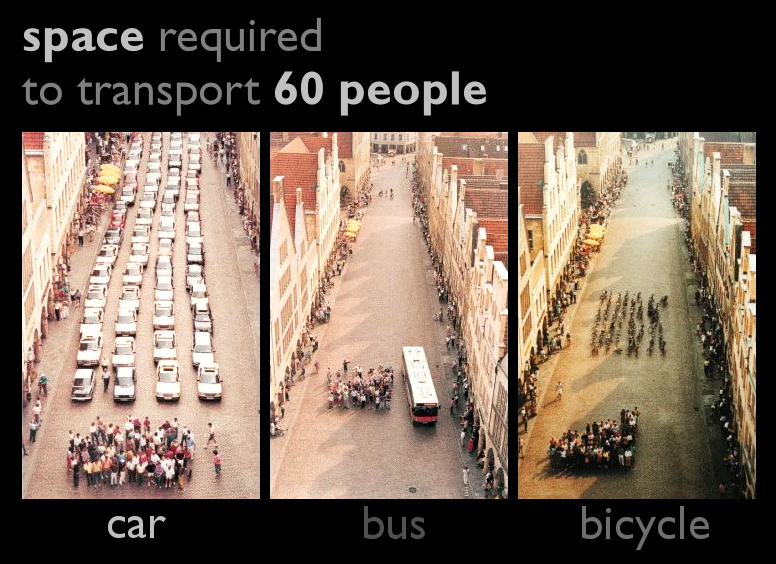 The fact that cars CAN transport 4 or 5 people doesn’t mean that they DO. Next time you’re commuting to the office in the morning, look to the left and then to the right of you. Cars usually have one passenger in them at any given time. More people are in them when you’re on a road trip or when the whole family is going somewhere, but since when do you go to your office with your whole family?! Additionally, the cost for the infrastructure necessary for these different types of transportation is proportional to the “space” needed. Maintaining bike lanes is never going to cost as much as adding lanes to highways and building overpasses. (Not to mention that you’ll end up paying $15-50 to fix a bike, but potentially thousands to fix a car… and crash with another bike at full speed, you might have a broken arm, crash with another car at full speed, and good luck to you.) And let’s not confuse the REAL issue here: more than a matter of “space”, it’s a matter of energy efficiency and how using these different types of transportation affects our overall well-being and the future of our planet. I’ll keep dreaming and posting. PREACH! Couldn’t have said it better myself.